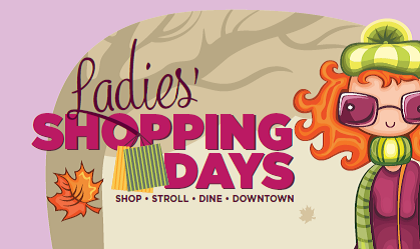 Grab your girlfriends, moms, sisters, and come join us for Ladies’ Shopping Days – Friday, Oct. 12th and Saturday, Oct. 13th. Pick up your cute tote bag that has a downtown shopping passport inside starting at 10am each day in front of Great Harvest Bread (360 A Street). The passport is full of coupons and offers from downtown retailers, restaurants, and salons. You’ll also find in your tote bag a gift registry card. Fill out your information, shop downtown, write down those things you’d like for Christmas, and we’ll send the card to the person you indicate. Drop off your registry cards at Great Harvest after a day of shopping. IFDDC will mail them to your special someone. Christmas shopping made easy for them, and you get what you really want! Enter to win two $50 downtown gift certificates to be given away!